Do You Want Your Bowls Full of Yummy? Yes? Well you came to the right place then! This blog is dedicated to bringing you yummy recipes that focus on gluten free, whole, and natural ingredients. I’ll be making and posting kid-friendly dishes, freezer meals, fast and easy meals, from scratch dishes, and baked goods and desserts! Join me on my very first blogging journey as I cook, post (really) bad pictures, and discuss other great topics I am passionate about like frugal living, growing a garden, raising a family, and tackling DIY projects. I hope you’ll stick with me as I find my way in the blogosphere and try to grow this blog into something that can benefit YOU! I welcome any suggestions you have! © 2014-2016 Bowls Full of Yummy. Unauthorized use and/or duplication of this material without express and written permission from this blog’s author and/or owner is strictly prohibited. Excerpts and links may be used, provided that full and clear credit is given to Bowls Full of Yummy with appropriate and specific direction to the original content. I checked out the cutest book from the library the other day. 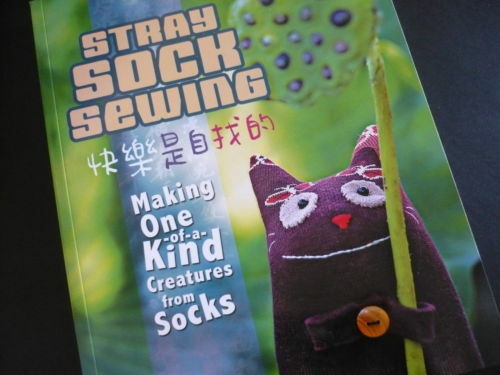 The book is called “Stray sock sewing: making unique, imaginative sock dolls step-by-step”. I tell you, this is the cutest idea for lonely single socks I’ve ever seen. 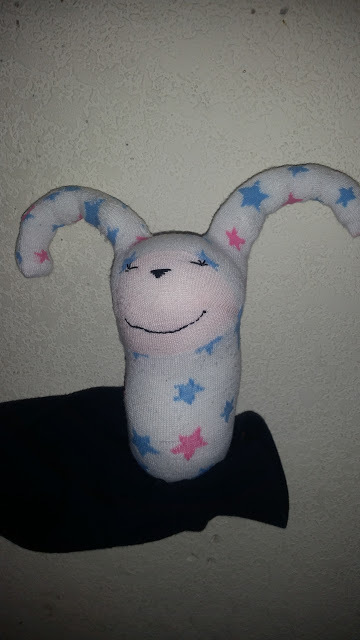 I wanted to show you a picture of the cute little creature I made. I’ll be making more of these little creatures for sure! CUTE! A whiiiiiiiile back I did a post bout freezer lasagna. Mmmmm, lasagna! 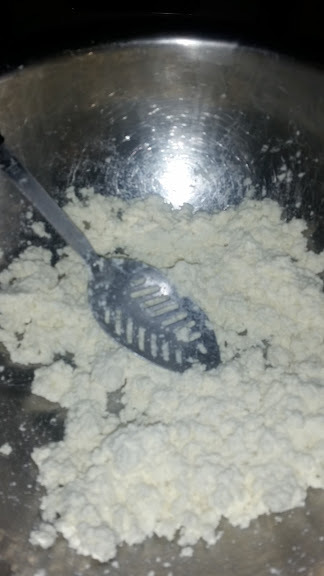 Anyway, I told you that I had made my own ricotta cheese to use in the lasagna. Well, I really make Paneer cheese, which is a cheese curdled with acid rather than with culture, like ricotta cheese is. I can’t tell the difference between the two when I’m putting it in lasagna. Don’t get me wrong, a wonderful creamy ricotta cheese has an absolutely delicious flavor that is very different than paneer. But for the purposes of lasagna (and a bunch of other baking and savory uses) I like paneer cheese just fine! So anyway, I thought I’d show you how I make it, even though there are a plethora of tutorials online. Gotta give the people choices! A gallon of whole milk will yield you about 10 ounces of the stuff, just enough for a big pan of lasagna! That’s it! 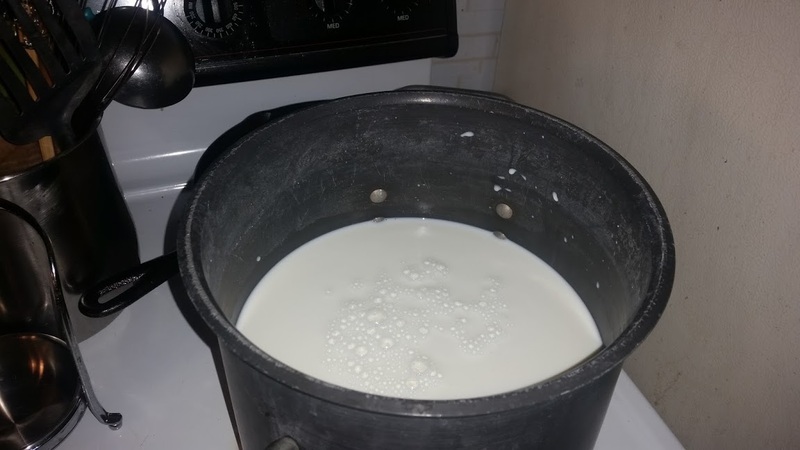 Now, heat your milk up in a big non-reactive pot (like ceramic coated cast iron or stainless steel, NO aluminum) over medium heat until just before boiling, about 200 degrees Fahrenheit. If you don’t have a thermometer (WHAT?!? Why don’t you have a thermometer?) just wait until it’s all foamy and steaming like crazy. 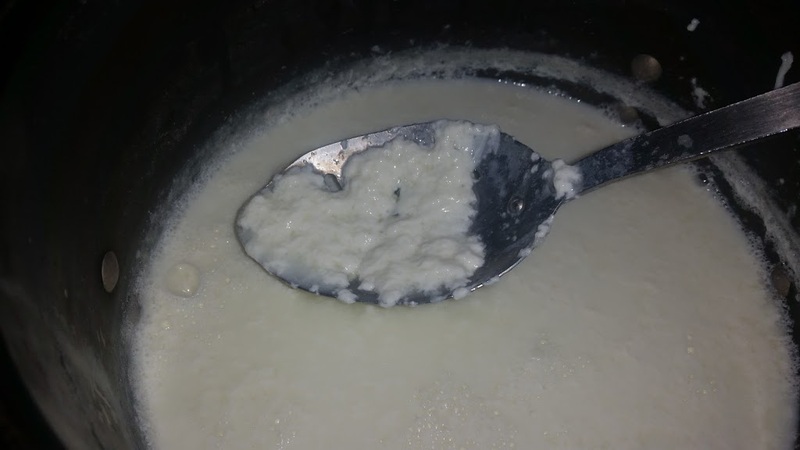 I’ve make cheese with milk that was boiling all over the place (…oops), and I’ve used milk that was 190 degrees, it’s okay it the temp is a bit off. You’re supposed to stir it the whole time so that nothing sticks to the bottom of the pan, but I’ll be the first to admit that I usually just let it go and DON’T scrape the bottom to leave the stuck on stuff for later (like…..when I do the dishes) Really, either way, unless you actually burn the milk, you can do whatever you want. If stirring for 20 minutes makes you feel more productive, go for it!!! TIP: Leave your milk out on the counter for a couple of hours (GASP!) before making the cheese to allow it to come to room temp, it don’t take as long for the milk to heat up! When the milk is all toasty warm, dump in the lemon juice and stir briefly to incorporate. Let it sit for 10 minutes. Strain into a cheesecloth lined colander (one or 2 layers will work) or a fine mesh strainer over a big bowl (if you want to save the whey -it’s the liquid left over- and it’s great to use in baked goods!) or the sink. I usually pour a bit, stir to release the whey, pour some more, stir, and repeat until all of the cheese is in the strainer. Allow to sit for about another 10 minutes. Dump the whole mess (it’s messy) into a bowl and you’re ready to go! Oh, and one more tip here: wash your cheesecloth in COLD water in the sink (NOT with other clothes or towels). Trust me. Here’s a list of helpful links to websites and other resources I have found immensely helpful, especially when starting out going gluten/grain free. I have not been paid or endorsed by any of these websites, these are tools I use in my daily gluten free life and I wanted to share them with you! I will be adding to the list regularly. If you have any sites/links you have found helpful and would like to share them, leave a comment and I will add them to the list! This is a wonderful and easy to read gluten free flour volume-weight conversion chart from Real Food Made Easy, also included is a brief description of each flour, I love this page and have used it so many times I’ve taped it to the side of my fridge, no joke!. Click here for a link to the link to the PDF. Brittany Angell has a wonderful website with a membership option (I currently subscribe, the member recipes are AMAZING!!!). I could go ON AND ON about how wonderful this site is, but you should really click here and check it out yourself! Oh, and make a recipe from her site tonight, you won’t be disappointed! Lynn from Lynn’s Kitchen Adventure developed a great homemade gluten free Bisquick style baking mix that can be used in so many different ways, I use it weekly at our house! She offers the recipe to the mix for free, you can get it here (along with a few recipes using the mix), and also a kindle or PDF book you can buy here (right now it’s only $2.99!) with tons of recipes using the mix (the browning are AWESOME!)! I’ve developed my own biscuit recipe using the mix and I’m sharing it with you! Use the ratio of 1 cup of baking mix to 1/3 cup of water or milk (I usually do 3-4 cups of mix at a time) and mix well, and either drop onto a baking sheet for drop biscuits or, just line a small baking pan with parchment paper and bake in one large, thin “loaf” and cut apart afterwards (my favorite way, even though the biscuits are square)! Bake the biscuits at 350 degrees Fahrenheit for 10-15 minutes for drop biscuits and about 25 minutes for the whole pan. SO EASY! Go check out Recreating Happiness. Wonderful gluten free website that has an AMAZING stuff-your-face-full-of-cinnamon-goodness cinnamon roll recipe, ’nuff said! Hello again! I thought I’d post this quick because some of you may be interested and I found it very helpful. I do not follow a paleo diet but I do cook paleo often and I know paleo safe foods are always healthy and nourishing. This is a simple but helpful visual representation of paleo safe food guidelines by Paleo Magazine. Hope it can help someone else! © 2014-2015 Bowls Full of Yummy. Unauthorized use and/or duplication of this material without express and written permission from this blog’s author and/or owner is strictly prohibited. Excerpts and links may be used, provided that full and clear credit is given to Bowls Full of Yummy with appropriate and specific direction to the original content. Busy with a whole lot of nothing! I have so much awe and respect for people that have an organized house, do meal planning, make regular posts on their blogs, mop their floors, eat dinner at a dining room table, and make lists. But I am NOT one of those people. Which kind of makes me seem like some kind of raised-in-a-barn, lazy, unorganized, cave woman slob. It’s not like I wouldn’t LOVE to live like those other organized, clean, normal people, but it just doesn’t work for me. Sometimes I really wish it would. Sometimes I feel like I’m so busy all the time but I’m never really getting anything done. And it’s not like I haven’t tried! I could fill 8 dumpsters with failed schedules, meal plans, chore charts, and unused cleaning supplies. Is it because I’m lazy? Do I really just not care? I don’t know. Maybe. But maybe it’s okay to just be who I am and serve a cooked-at-the-last-minute dinner to my family on the couch or in their bedroom (who lets their kid eat in their bedroom??? ME!) while rushing to get out the door to cheer meet or baking like a mad woman for the bake-sale Saturday while working around the huge pile of dishes in the sink/counter. Whew! Stressed out yet? Well, I’m not. It seems like I would be under a huge pie of stress at all times living the way I do but curiously, I’ve never really felt that way. I strive in rushed and stressful, pressure filled situations. My family doesn’t seem to mind anyway. It’s not like my house is “gross dirty” or dangerous anything, you know? I get the laundry done, everyone has clean clothes to wear. I get the dishes done, no one is eating off the counter. I sweep/vacuum my floors, um……..once in a while. I’m the WORST with floors! What I’m trying to say is that although my house/meal planning/schedule may seem chaotic and ridiculous to some, for me and my family it’s just right and I don’t feel guilty about it one bit. Well, maybe ONE bit. But certainly not two. How do you feel about the way your run your household? Are you one of those super organized people? Do you have any quick tips us lazy slobs out there??? Take my poll! Guess which one I chose? T.V.!!! © 2014 Bowls Full of Yummy, Unauthorized use and/or duplication of this material without express and written permission from this blog’s author and/or owner is strictly prohibited. Excerpts and links may be used, provided that full and clear credit is given to Bowls Full of Yummy with appropriate and specific direction to the original content.